IndieBound Description:Mrs. Frisby, a widowed mouse with four small children, is faced with a terrible problem. She must move her family to their summer quarters immediately, or face almost certain death. But her youngest son, Timothy, lies ill with pneumonia and must not be moved. 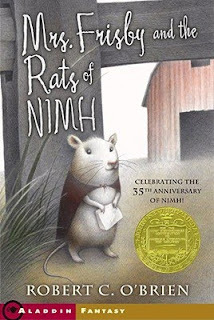 Fortunately, she encounters the rats of NIMH, an extraordinary breed of highly intelligent creatures, who come up with a brilliant solution to her dilemma. And Mrs. Frisby in turn renders them a great service. This is one of those books you can read over and over and again and enjoy each time. I read this book as a child and remembered it so fondly that I bought a copy while I was in college. Even though I was older, it had not lost any of its charm. It's a true timeless classic, well-deserved of the Newbery medal. I have to say, I like the new cover better than the one I have!